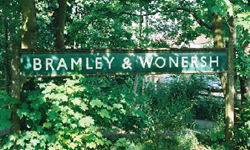 When the line opened, 'Bramley & Wonersh' station was just named 'Bramley', but was renamed on 1st June 1888. 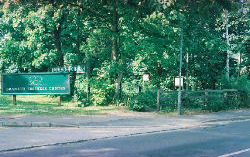 It was named after the two villages that it served. 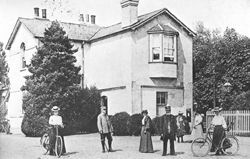 Although actually in Bramley, it is only 'spitting distance' from Wonersh and fairly equidistant from the the two village centres. 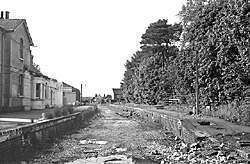 Heading for Guildford, it was the last station on the branch line before joining the main line at Peasmarsh Junction. 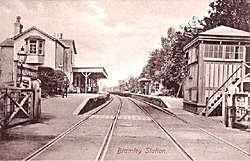 In late 2004 the station underwent major renovation works, by the local council and the Bramley Historical Society. 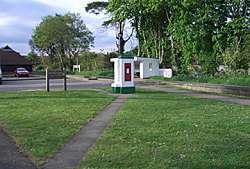 So as well as the photos from 2001, below are a second set from 2005 to show the changes. 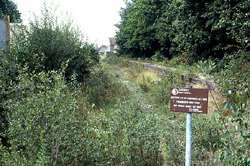 In 2001 the platform edges & even station sign are still visible, even if the trackbed is somewhat overgrown. 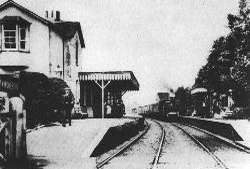 By 2005 the station is looking much like it was, with a new waiting room, and repainted station signs. 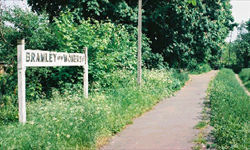 In 2001 the original enamel Station sign is just visible behind the new 'Bramley Business Park' sign. 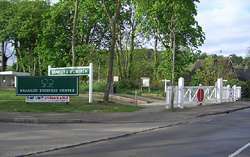 By 2005, the sign is much more visible, with it's concrete surround having a new coat of white paint, and Replica Crossing gates have been installed. 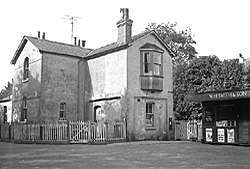 When the station building was demolished, the corner holding the postbox was left! 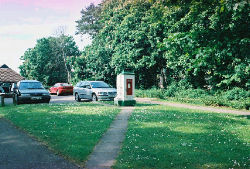 Not much has changed between 2001 & 2005, except the postbox has a new coat of paint. The new replica waiting room is just visible on the other platform behind. 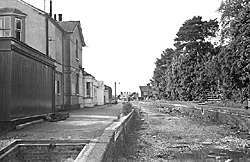 Here you can see the station buildings from the level crossing on Station Road, looking north towards Guildford. 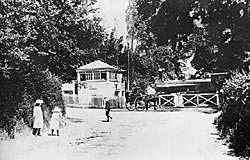 The first picture is from the early 1900's and the second is from an post card of the line dated August 1908 which was sold on ebay in 2005. 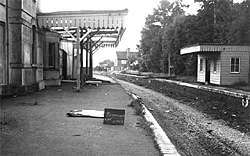 By september 1966 (left) 1 year after the line closed, the track has gone and the station canopy is in a bad way. 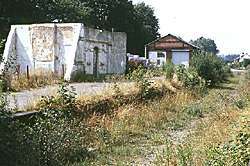 10 years later in 1976, only part of the first floor of the stationbuilding is left, and the whole site is very overgrown. 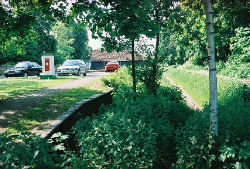 The platform edges can still be seen in 2001 even with an overgrown trackbed. 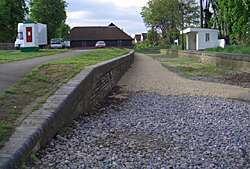 The 2005 retake shows them much clearer with the newly laid track ballast, and the gravel golden path that now runs from Bramley station all the way to the footbridge over the main Portsmouth line at Shalford Junction, just beyond Peasmarsh Junction where the branch joined the main line. 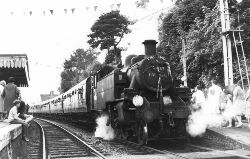 Photo used with permission © Norman Hamshere The last scheduled 'up' train, pulling out of Bramley & Wonersh, on it's way to Horsham. 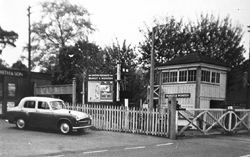 12th June 1965. Both concrete station signs are still in very good condition. The enamel sign was returned to the station in the mid 1990's after being used for many years as a shelf in a greenhouse in Worthing!